Sternum pain is a pathological sensation caused by various influencing factors and is often defined in the region of the sternum. The sternum is a flat bone formation located in the center of the rib cage. Ribs are attached to it with their front edges. The sternum is relatively close to the heart, which is why people with different cardiovascular diseases confuse the pain that arises with pain of a different origin. The pain in the sternum can proceed briefly, then they talk about acute pain. In other cases, the symptom is present for a long time, as in chronic pain. Unpleasant sensations sometimes occur inside and around the region of the sternum or are determined behind the bone. Video: Why does the chest hurt? Sternum or brisket (sternum) is a long, flat bone located in the central part of the chest. It connects to the clavicle and 2-7 pairs of ribs through cartilage and forms the front of the chest. The main function of the sternum is to protect the heart, lungs and main blood vessels from traumatic injuries. In its form, it resembles a tie, and among all the flat bones of the human body is the largest and longest. Two clavicles are attached to the upper part of the sternum, and rib cartilages of the first seven pairs of ribs are attached to its edge. Sternopericardial ligaments are attached to the inner surface of the sternum. The apex of the sternum is also connected with the sternoclaid-mastoid muscle. The anatomical position of the sternum is defined as tilted, down and forward. The brisket is slightly convex in front and concave in posterior. The shape resembles the letter “T”, because it narrows at the point of transition of the handle into the body, after which its slight expansion to the middle of the body is again observed, and then narrowing to the lower part, that is, the xiphoid process. In adults, the sternum on average is about 17 cm, while it is larger in men than in women. Sternum pain can occur for various reasons related to the disorder of various organs and body systems, so an assessment of severe and severe pain is extremely necessary. The nature and duration of pain may vary depending on the factor of exposure. It is important to understand that, although chest pain is considered an adverse symptom, it should not become a cause for panic. Stress and anxiety often only exacerbate an existing problem. Therefore, awareness of the possible causes of pain in the sternum and its management can help in solving unpleasant situations. Irradiating to other parts of the body. Muscle cramps or tissue injury often lead to pain proportional to the severity of the injury. Also, painful sensations often become aggravated during movement and breathing. When pain in the sternum is caused by heart or lung disease, it can be combined with other symptoms, such as sweating, difficulty breathing, coughing, etc. In the presence of gastric disorders, abdominal symptoms, such as nausea, vomiting, burning sensation in the stomach, abdominal pain, or bloating, are sometimes even more disturbed than sternum pain, which in such cases is an additional sign. The nature of pain in the sternum varies depending on the cause. The most common symptom is severe pain in the center of the chest, which may radiate with the development of the same myocardial infarction. Injuries to the clavicle with bruising, swelling, difficulty breathing, or an unpleasant sensation in the joints near the sternum. In the latter case, such manifestations often occur due to excessive bleeding in the area of ​​the affected collarbone. Pathology is most common among the causes of pain in the sternum and most often occurs when the cartilage between the sternum and the ribs becomes inflamed and becomes irritated. Costochondritis can sometimes occur as a result of osteoarthritis, but sometimes it can develop for no apparent reason. Acute pain on the affected side of the sternum. Pain worse during deep breathing or coughing. 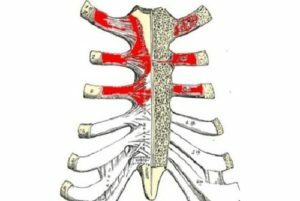 Discomfort in the attachment of the ribs to the sternum. 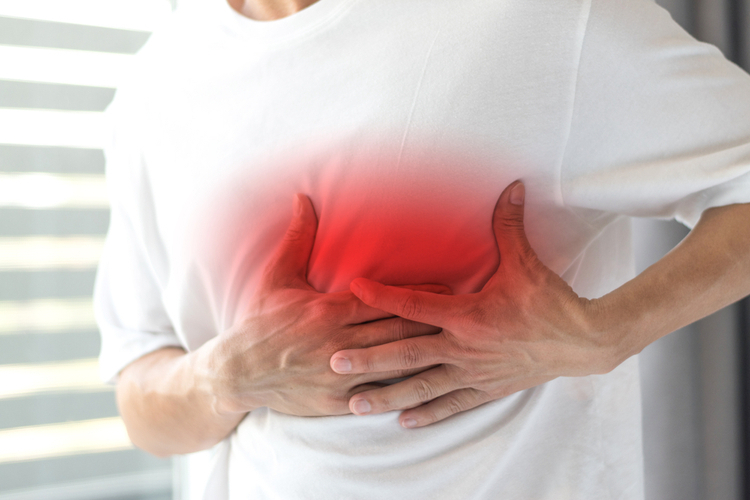 Costochondritis does not usually cause concern. However, people experiencing the symptoms of this disease may consult a doctor if their symptoms worsen or do not disappear. The sternoclavicular joint connects the handle of the sternum with the clavicle. Damage to this joint usually contributes to the appearance of pain and discomfort at the top of the sternum, and in some cases throughout the upper chest. Clavicle bruises, even of minor intensity, can lead to prolonged pain or limited movement in the shoulder and in the upper chest. 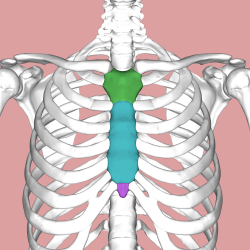 The clavicle does not relate to the composition of the sternum, but it is directly connected with it through cartilage, which ossifies in adults. Clavicle injuries are often the cause of pain in the sternum. Clavicle bruises often occur because of a serious injury, for example, during sports activities or a car accident.Sometimes the cause of the disorder can be an infection or arthritis, which gives complications to various parts of the joint system. Sensation of clicking and turning in the shoulder joint. A herniated mass is often not the obvious cause of pain in the upper part of the sternum. In exceptional cases, the pathology becomes the cause of adverse pain. An esophageal hernia occurs when part of the stomach enters the chest through the opening in the diaphragm. 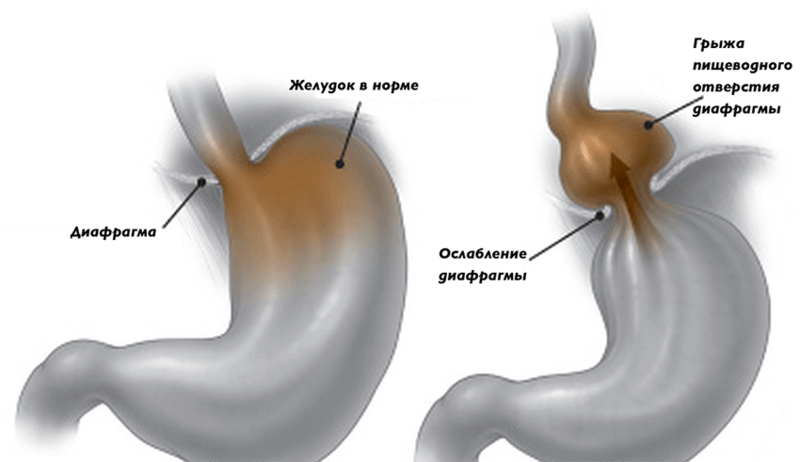 People with recurrent or increasing pain and symptoms of hernia of the esophageal orifice should consult a doctor for surgical treatment. Like any injury to other parts of the body, a sternum fracture is accompanied by severe and prolonged pain. Fractures of the sternum handle usually occur as a result of the direct impact of a traumatic factor such as a car accident or damage during sports training. People who believe that they may have a fracture of the sternum, should see a doctor as soon as possible, since other organs like the heart and lungs can also be damaged. The sternum and ribs are joined by many muscles, which are necessary to perform certain movements. These muscles can be stretched or strained with a strong cough or excessive physical activity involving the arms or the body. Injuries or injuries can lead to hematoma of these muscles, which in turn can cause various discomfort, including pain. People experiencing any chest pain may be worried about a heart attack. However, the pain in the sternum is different from the pain that occurs during a heart attack (myocardial infarction). As a rule, before a heart attack one has to experience certain sensations that are harbingers of the onset of a myocardial infarction. In contrast, pain in the upper part of the sternum in most cases begins suddenly. Often determined by restless breathing. 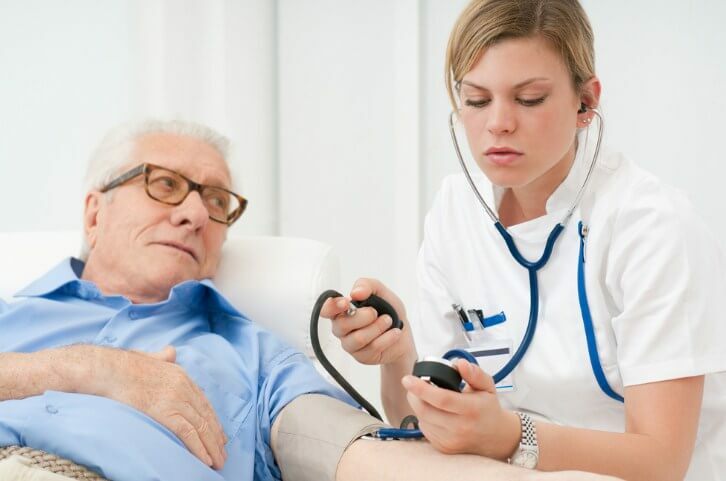 If there really is a suspicion that a heart attack has occurred, you should immediately seek medical help, which will allow you to avoid not only serious complications, but also death. Careful examination of the history and clinical examination of the patient can help identify possible causes of pain in the sternum. Arthritis and joint problems are often manifested by concomitant inflammation and pain when you touch the affected area. Muscle injuries or fibromyalgia can also be determined by physiological examination of the patient. 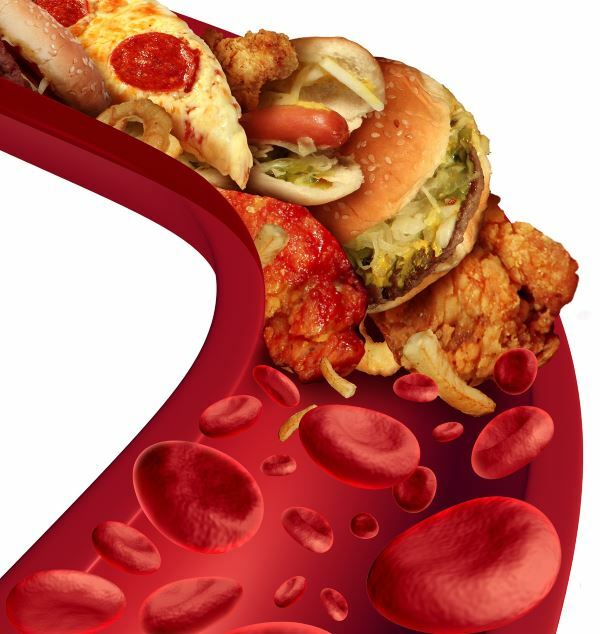 Further diagnosis is often carried out on the basis of existing and associated symptoms. 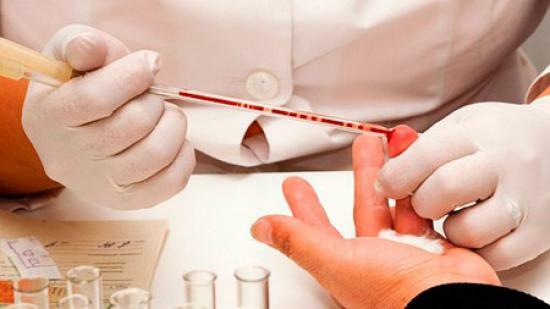 First of all, blood is examined to detect inflammatory reactions, infections, etc. An injury, bruise, damage to the joints, arthritis, or costochondritis results in an x-ray, a computer scan of the bones, or an MRI. This eliminates bone fractures and tissue damage. Additional tests, such as electrocardiography (ECG), gastroscopy, may be considered. Although pain in the sternum most often does not bode well for anything, there are some causes associated with pathological manifestations that require immediate medical attention. additionally determined intense nausea or vomiting of blood. The person should also consult a doctor if the pain in the sternum does not go away even against the background of the prescribed treatment. In such cases, additional examination may be required. Treatment of pain in the sternum usually depends on the underlying cause. For pain caused by injuries and muscle tension, ice packs or hot compresses are often used as first aid. In such cases, it usually takes rest to help the damaged tissues recover more quickly. 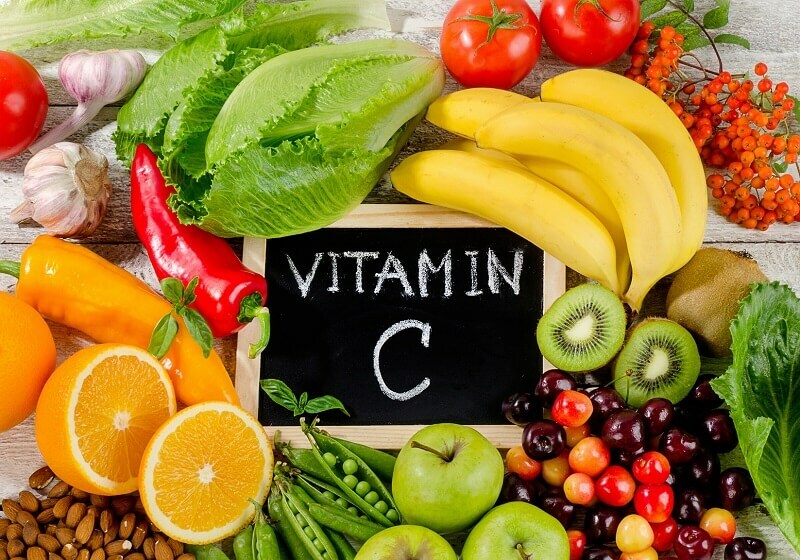 Additionally, anti-inflammatory drugs can be used. Physiotherapy procedures are also often recommended. 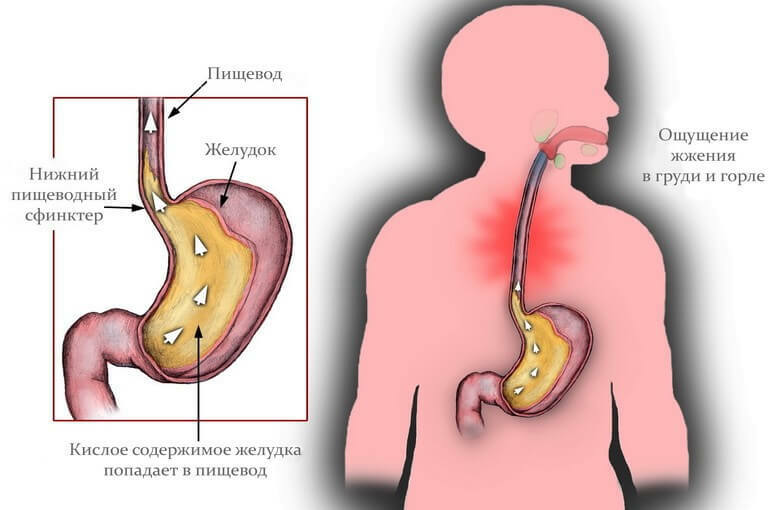 Gastric and acid reflux disease, which causes pain in the sternum, is most often amenable to treatment with antacids and a mild diet. Heart and lung diseases require special treatment, and some patients may require hospitalization, which depends on the severity and severity of pain in the sternum. The pain behind the sternum are associated with various causes, and cardiovascular or pulmonary diseases are considered the most unsafe factors. With the help of modern methods of research it is possible, as a rule, to establish the correct diagnosis.